First of all, if you are pregnant, DO NOT READ THIS BOOK!!! Seriously. 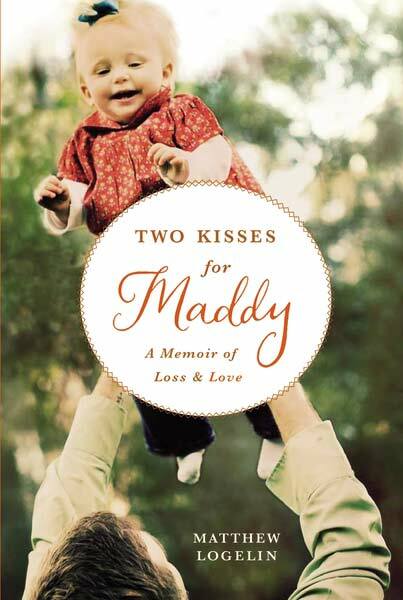 Two Kisses for Maddy is one of the most honest, heart wrenching books I have ever read. It’s a true story, told from the perspective of a father whose wife passed away 27 hours after giving birth to their first child. I laughed so hard I cried, and I sobbed alongside the father as he recounted losing his wife before she even got to hold her baby girl. The book starts out as the love story of Matt and Liz. They met the summer before they both went off to college (he in Minnesota and she in Los Angeles), but decided to give the long distance thing a try. After 4 years of cross-country flights and phone conversations, she accepted a business consulting job in LA while he went to Grad School in Chicago (the LDR continued). After his graduation (and 6 years of LD dating), Matt moved to LA to be with Liz. She stayed in her cushy job (she was a raging over achiever and was quickly climbing the corporate ladder) and he took a job with Yahoo. Both jobs required extensive travel (he was in India for 6 months, she was in Connecticut Monday-Friday), so they STILL weren’t together much (sound familiar??). During all of this, they are world travelers (my dream!). They got married, honeymooned in Greece, and visited half a dozen countries that I can think of off the top of my head – probably more. And then they bought a house. And they Liz got pregnant. They really were living the dream. After a few months, Liz’s pregnancy issues caused her to go on bedrest for the duration of her pregnancy. When the baby’s heart rate went dangerously low, the doctors made the decision to perform a C-section, 7 weeks early. Maddy was born a beautiful, healthy girl, but had to spend 24 hours in the NICU for observation. Mom was wheeled into recovery where she slept and rested until it was time to visit Maddy. Finally, the 24 hours passed (and then 3 more, since mom was still sleeping). Because she’d been on bedrest for months, the nurses made Liz walk three laps around the hospital room before she could be taken to the NICU. She did it and then made her way to the wheelchair – but 1 foot before she got there, she hit the ground, unresponsive. We later learn that a blood clot in Liz’s leg, likely caused from having not stood for months, traveled to her lungs and led to her sudden and unexpected death. Matt’s account of those moments is so vivid, you feel as if you are there, experiencing it alongside him. His agony and anguish are palpable, as are his fear and anger. He’s now left to be a single father to his newborn daughter (and he describes himself as a hipster – unmotivated, dirty and utterly irresponsible). Maddy was her mother’s biggest dream, and this was Matt’s biggest nightmare. The book then goes on to show what Matt’s life looked like during his first year with Maddy. Liz’s funerals, trips to see family members, the inability to get out of bed (if it weren’t for Maddy), international trips, holidays and anniversaries (wedding, birth, death) – each are painful, yet make Matt a little bit stronger. I mean it when I say this was an absolutely AMAZING read. I’m so glad I’m not pregnant, because it would have given me a serious complex about birthing my child. I would definitely recommend this book to any non-pregnant woman out there.